Is feeding time always messy and stressful? This is what you should do. Kids have a love-hate relationship with food—some will eat almost everything you put on their plate, while some are picky eaters. Feeding your baby can be stressful and messy business, especially if you want nothing but to the best for your little one. You've probably tried the airplane move, the colorful plate, and even entertaining him with his favorite TV show but nothing seems to work. Below are tips on how you can raise happy, healthy eaters without stressing out during mealtime. Your baby has a way of telling you what he needs, when he needs it. Take your time, and be flexible when it comes to his feeding schedule. Every baby is unique, so it's best to listen to your little one's cues. If you want to stick to a feeding schedule, adjust to your baby's cues. Once he gets older, you can slowly adjust to feeding him at certain times during the day. 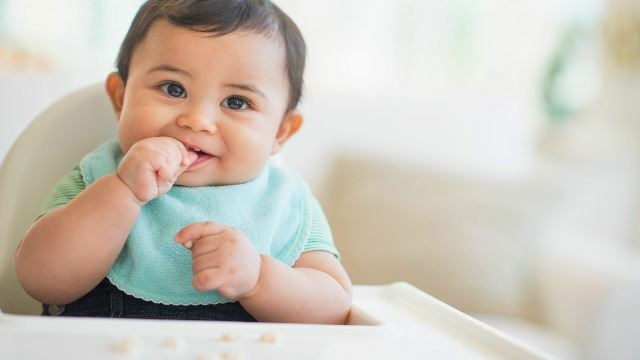 We've been told not to play with our food but did you know that it is actually beneficial for babies to play with food as they learn flavors, texture, colors and the name of the food they're eating. Let them use their hands, put food out of the plate area and mash those boiled veggies. Use bibs, suction cups and bowls if it helps to make cleaning time easier. Introduce one new type of food at a time—this will allow you to check for allergies and expose your baby to new flavors and textures. Start him on veggies so he can learn to love how they taste and feel in his mouth early on. You can also start adding delicious herbs and spices to his mashed food so he can familiarize himself with all sorts of tastes. Check out some recipes here. Don't give up on your baby easily. Research shows that it takes around 15 times of eating the same item before they grow love for a certain food. Just because he refused to eat broccoli the other day doesn't mean he's not up for it anymore. You may want to mix and match his meals or serve it in different forms- steamed, mashed or grated. Do not be pressured to introduce all types of healthy food at the same time. As long as baby is gaining weight, there's not much to worry about. Make sure to keep baby comfy during feeding time with the right clothes and a diaper that has the perfect fit. Did you know that when your baby eats his tummy expands to up to 40%? If he's wearing tight fitting clothes, he won't feel comfortable when his tummy expands during feed time. Make sure he's wearing something that can adjust to his movement and his changing body. You can try Huggies Dry Pants 360 Comfort Fit, which has an all-around garterized waistband and leg elastics that ensure proper fit, perfect for both feeding time and play time. When baby's all comfy to move around, he won't get fussy making him more enticed to eat and finish his meal. Babies go through a challenging feeding stage and it is up to us to create a healthy eating environment. Remember to take your time and to be open with different feeding tips that may work for you and your baby. What are your tips on how to make feeding time mess and stress-free? Share it here.